“The moon blew up without warning and for no apparent reason.” Yup – that’s the first sentence of Neal Stephenson’s new door-stopping, sleep-interrupting hefty tome. A couple pages on comes: “The good news is that one day the Earth is going to have beautiful rings, like Saturn. The bad news is that it’s going to be messy.” LOL! Section 1 is basically concerns what happens when the people of the earth realize they are going to die because the moon has exploded and in the very near future the human population will be bombarded by its pieces – what they come to call “hard rain.” The international plan is to save a few thousand humans, historical artifacts and create a new civilization on a “Cloud Ark,” designed and developed by the “ark-itects” and sending the specially selected people to live there. Other folks go underground or do whatever they can think of, but the surface of the earth will be uninhabitable when the pieces of the moon explode into a white cloud of rocks and then millions of pieces, shrapnel really, start bouncing off each other for an unknown number of millennia. The deadline to have this Cloud Ark up and running is two years. Section 2 is comprised of one episode after another as the space colony tries to survive a variety of difficulties. The techno-speak goes into high gear and some personality issues arise. I won’t get into the specifics of the rather abrupt last third, but the return to earth 5000 years later has it’s interests and drawbacks as narrative. It’s mostly a travel guide with a light plot threading through. This is where some ideas show up. The techno-thriller part is kind of along the lines of The Martian by Andy Weir (which I read back in April) because the emphasis on the science. But where Weir’s book relied a lot on common sense, potatoes and duct tape, Stephenson is more interested in extrapolating from cutting edge science and engineering. Fwiw, Stephenson is a much better wordsmith in general, but Weir’s protagonist is a fine model of character development. 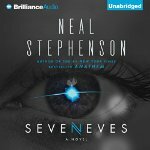 There are a LOT of characters in Seveneves, most of whom are female (to assure fertility) – but there are really only a few who are really important to the plot: Doc Dubois (Doob – a male scientist), Dinah, Julia and a few others. But even the lead characters lack real interest as they seem to be cut from the same piece of cardboard, except possibly Julia, the politician. They’re more like mouthpieces and roles for the ideas Stephenson wants to explore (lightly). Overall the book is rather interesting if you’re not looking for character development or plot line, but more curious about the idea development but I’m sure it could have been done in a couple hundred fewer pages because its Stephenson’s incredible imagination which is on full display for over 800 pages as he creates his worlds in scrupulous detail down to the screws and “gnats” (insect-sizes robots). Whew! – and sad to say I can’t say as how I paid attention through to every word. I’ve read a number of Stephenson’s books and I’m generally a fan – Snow Crash remains my all time favorite – Reamde is next – good stuff there. This one is just not up to that standard. Finally, fwiw, the readers are fine although it takes a bit to get used to Kowal.